The Leyland cypress (x Cupressocyparis leylandii) has a lot going for it. Fast growing, with evergreen, feathery foliage and a pleasing, slender profile, it makes an excellent specimen tree or screening plant. Unfortunately, there's a downside to go along with all that goodness: The tree is susceptible to several insect pests, diseases and environmental issues that can damage it, causing the foliage to turn brown. Growing in U.S. Department of Agriculture plant hardiness zones 6 through 10, the Leyland cypress thrives in mild to moderate climates and can tolerate salt spray, which makes it an excellent choice for home gardeners who live near the coast. Damage to these trees can occur in the winter, however, when dry, cold winds draw moisture out of the tree's leaves, causing them to turn brown. Reflective sunlight on snow can scorch leaves, also turning them brown. There's not much you can do to protect the tree other than providing shelter for it -- if your Leyland cypress grows in a pot, consider moving it to a location where it will be protected from strong winter winds. In early spring, remove the brown branches and your tree should bounce back. The Leyland cypress is vulnerable to diseases that damage both the roots and foliage. The most destructive is a fungal disease called Seiridium canker, which presents as dark, depressed areas on the wood. Often, you can see tiny black spots on the wood, which are the fruiting bodies of the fungus. Affected foliage turns reddish-brown and should be pruned out. To prevent the spores from spreading, dip your pruning tool in a solution of 1 part bleach to 9 parts water before you make each cut, and cut a full inch below the canker. No chemical controls are effective in preventing or curing the fungus, according to the North Carolina State University Plant Pathology Extension. Other disease that might cause brown foliage include root rot diseases, which weaken or destroy the roots of the tree, causing the tree to gradually sicken or die. Bacteria and fungi that live in the soil are usually responsible. Chemical control is not effective in this case either. The best cure is prevention -- make sure your trees are planted in well-drained soil where no previous plant has died of a disease. You probably won't even notice if your Leyland cypress tree is home to a few bugs -- unless it's home to the common bagworm (Thyridopteryx ephemeraeformis). The bagworm is the most serious insect pest of the Leyland cypress, according to the North Carolina Cooperative Extension. Infestation can stunt the growth of the tree, and severe infestations can even kill it. The caterpillars feed on the needles, causing them to turn brown and fall off, and they produce little bags that look somewhat like cones. Usually, natural predators are enough to keep bagworm populations low enough to avoid seriously damaging the tree, but you can also remove the bags to help control the spread of the pest. Like all plants, the better the growing conditions, the stronger and healthier the plant. 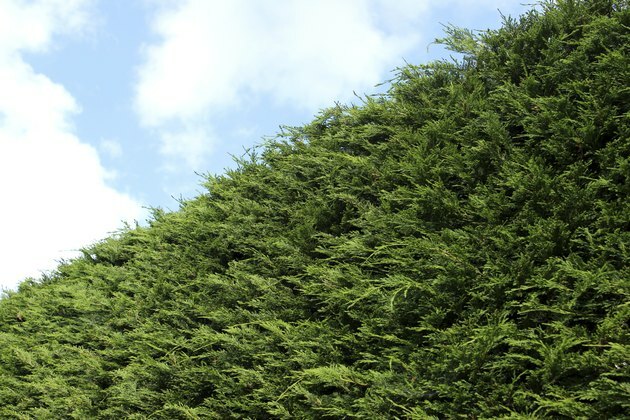 Adverse environmental conditions can stress a Leyland cypress, making it more vulnerable to diseases and pests, stunting growth, and causing the foliage to die back. Although they will tolerate poor soil, partial shade and occasionally dry conditions, Leyland cypress trees need full sun and rich, moist and well-drained soil to remain healthy. Extended periods of drought can stress the tree, especially in hot climates. A cross between two Pacific coast species, the Leyland cypress thrives best in moist, cool climates.